The three parties which run Amsterdam city council have drawn up a string of proposals for dealing with the city’s red light district and moving prostitution to a new location is one of the options, the Parool reported on Wednesday. City mayor Femke Halsema said earlier that there are ‘no taboos at all’ when it comes to making the area, the oldest part of the city, more habitable. She is due to publish her vision on prostitution next year. The area has been home to prostitution for centuries, because of its proximity to the docks, but the surge in tourism is causing both locals and prostitutes considerable problems, the paper said. Many clients are now visiting prostitutes they find via internet or at a hotel rather than in the Wallen district. This means that many red light windows are now empty during the day and several people have suggested closing them altogether. The three coalition parties – GroenLinks, D66 and the Socialists, now suggest giving licences for prostitution outside the red light district, so the women who work in window brothels can move to a new area, without the problems caused by tourists. This would also allow prostitutes to work in anonymity ‘away from photo-taking tourists,’ said D66 councillor Alexander Hammelburg. ‘The Wallen are no longer the ideal location’. The councilors hope that by removing prostitution, the area will become less attractive to tourists. Prostitution is a major tourist draw, but is this really the reason you want to attract people to visit?, said Socialist councillor Nicole Temmink. 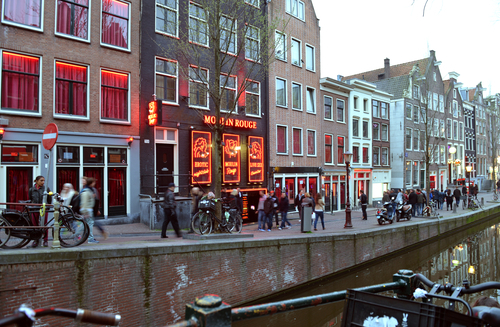 None of the parties support the compulsory closure of brothels in the red light district. In June the city council’s audit office said Amsterdam has not succeeded in its efforts to clean up the red light district. The old city centre still contains a ‘monoculture’ of tourist shops and low-value cafes and bars and nor have officials been able to get a grip on human trafficking and forced prostitution, the report said. The ambitious programme to clean up the city’s 1012 district was started 10 years ago by then alderman Lodewijk Asscher, who now leads the Labour party.